This was the visit the children of Parkside Infant School had been waiting for with great anticipation. 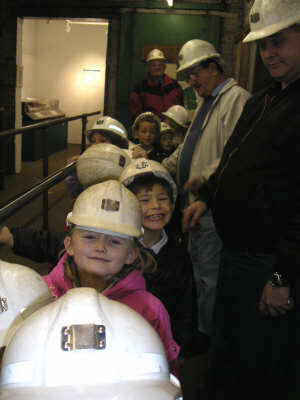 A group from the school accompanied by parents, teachers and members of the SDVT Banner Fund travelled to West Yorkshire to the Wakefield Mining Museum. The children were to have the priviledge of descending into a real coal mine. They were accompanied by former miners who told tales of what it was like working there in the old days. "Miner Tom" Race and SDVT Banner Fund Treasurer, Ron Meir became storytellers for the day and the children loved every minute and learned a lot about working in a deep coal mine. Unfortunately, we were unable to take any photographs down the mine because of the danger posed by the electrical flash of a camera. However, we took a few pictures of the trip above ground or "at bank" as the old miners would say. You can link to them below.